There have been various strategies explored for learners diagnosed with CVI to help them learn to read. The APH CVI website has several pages addressing literacy, starting with the developmental need of emergent skills. Emergent skills need to be developed before children are ready for formal reading instruction. Exposing young children to books, putting foam letters in their hands, listening to letter sounds and nursery rhymes are great activities! Once a child understands that symbols/pictures have meaning, they may be ready to explore letters and words. Another prerequisite to reading is the Learning Media Assessment. 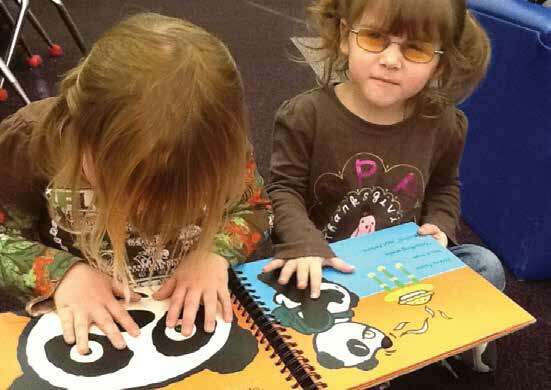 We cannot assume that we know how any child with visual impairment will best utilize reading materials unless we collect data through a learning media assessment. If a learner is determined to be tactual reader, exposure to braille materials is necessary. If a learner is determined to learn through listening, then listening skills need to be developed. If a learner is determined to be a print reader, exploration will be needed to determine how print is presented. Consideration needs to be given to the background on which letters are presented. Some children may need a solid colored background while others can discriminate the letter from a more complex background. The amount of space between letters and how many letters are presented at one time can also be determined through assessment. CVI Scotland offers a helpful blog on Fonts. They have also developed a free tool with multiple functions and settings, designed to make reading easier for people with CVI. Look can be used for all level of readers, from a non-reader learning to read, to an experienced reader wanting specific settings to read faster and more comfortably. To build reading skills, there is the further option to select the number of words you wish to appear on the screen at a time, of more than one, including seeing a whole single sentence at a time. It may be that a combination of media will work best for a learner. Consistent and ongoing observation and assessments are essential to determine which materials will help the learner be successful. 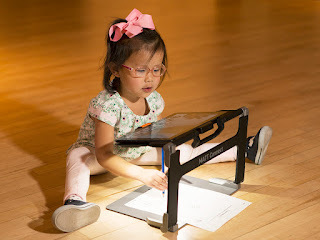 Once literacy needs are determined, TEACHCVI has developed a Literacy Profile, a practical tool to be used by teachers and other professionals in order to collect information about the functional vision and literacy of children with CVI. I write to ask you to consider being more inclusive in your information posted about CVI and literacy. Where is reference to the extensive work done by Dr. Christine Roman-Lantzy (Cortical Visual Impairment, An Approach to Assessment and Intervention, Second Edition) ? You may or may not remember that I submitted a product proposal for 3D High-Frequency words in 2016. At that time you responded that although my proposal was not approved, you had "numerous requests for letters of many different varieties" and that you were putting together a focus group of project leaders to discuss how to fulfill needs in this area." As CVI Project Leader, I ask you what has happened since 2016 with regards to the work of this focus group and the plans for upcoming CVI literacy materials? In the meantime, parents and families of CVI kids will continue to share our "best practices" based on the work of Dr. Roman-Lantzy, Matt Tietjen, Ellen Mazel, Yvonne Locke and countless others who help us in our journeys with our respective CVI kids.